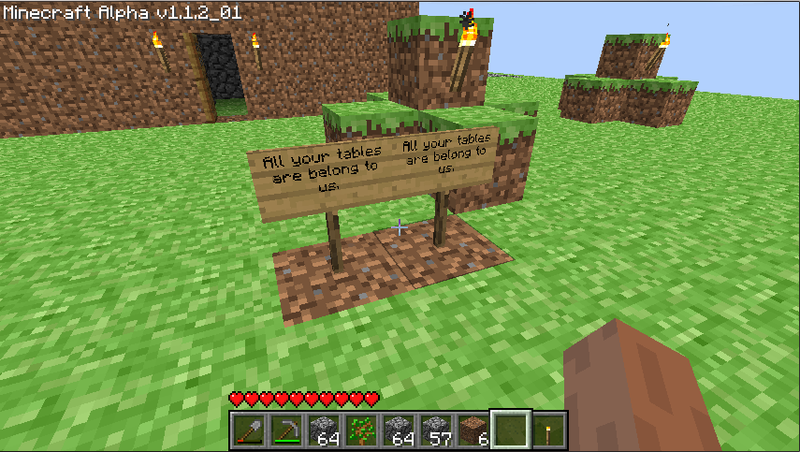 Well I logged in today to find all the tables had been stolen and replaced with signs. Actually, I thought it was funny but it was annoying replacing all the tables. It wasn't just these two but a few others. We should probably create a thread or topic especially for reporting grief and when it was found. Maybe Baron/Mods are able to view logs to see who did the reported grief and ban/warn any users found griefing? Dunno just a thought. *edit* Oh it was actually a lot more tables than I thought. I counted about 12. I've removed the signs and created new tables in their place. This was a complete joke. He was telling me about it today. Doesn't make it acceptable, but maybe you could forgive him - it is kind of hilarious to create a conspiracy in a game like this.